A San Diego-area group is working on a treatment that could lead to a reversal of Parkinson's disease symptoms. SAN DIEGO (KGTV) -- San Diego resident Jenifer Raub describes herself as a fighter. “I just don’t give up. If I see a window, just a little crack in the doorway of opportunity, I’m going to jump on it," said Raub. She never imagined to find herself in the fight against Parkinson's Disease, a progressive nervous system disorder which affects movement and has no cure. “For me, it was I had a hard time walking, but it was real intermittent, it just made no sense, and then my hands started to shake," said Raub. In the beginning, Raub refused to believe the diagnosis, eventually finding a doctor who told her what she wanted to hear. So Raub shifted her fight towards finding a cure for Parkinson's. She's now president of the Summit for Stem Cell Foundation , a nonprofit created to support the use of stem cells to treat Parkinson’s; research underway in Dr. Jeanne Loring’s Torrey Pines lab. “We’re right on the edge of a revolution, in which these particular cells, because of their power and our ability to manipulate them, are going to change the way medicine is done," said Dr. Loring. Her research focuses on pluripotent stem cells, the remarkable cells that self-renew and can give rise to every cell type in the body. Parkinson’s Disease breaks down and eventually kills certain nerve cells in the brain, dopamine neurons that affect movement. Dr. Loring's team is working to transform patient's skin cells into pluripotent cells which can then become dopamine neurons. 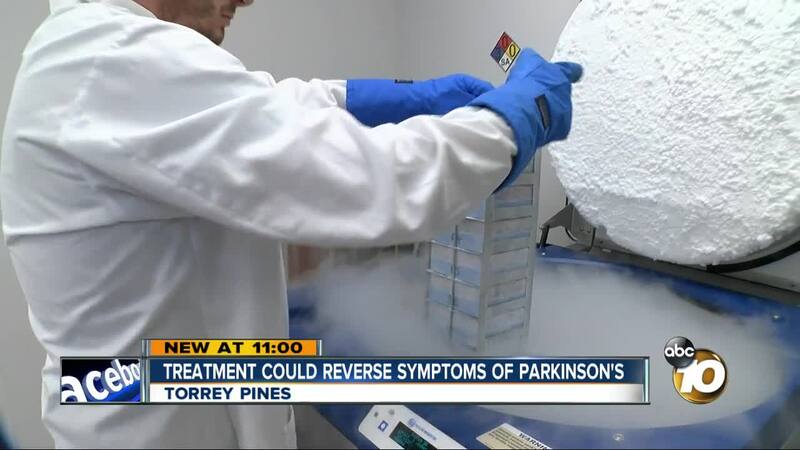 “We plan to transplant those cells to the brains of people with Parkinson’s to replace neurons they’ve lost," said Dr. Loring. Because the cells come from the actual patient, they are a perfect match which the body will not reject. After the implant, Dr. Loring says over time they'll make connections and restore circuits that have been broken by the loss of dopamine neurons. Patients, she says, will likely start seeing changes in their symptoms in six months. Dr. Loring believes the treatment could also work for other diseases like Alzheimer's and Multiple Sclerosis. ‘These diseases are not going to able to be treated with a conventional drug that you take, it's going to have to be more sophisticated than that, and I think this opens the opportunity for really scientifically-based, knowledge-based therapies. Stem cells are medicines; we can't forget that. They're living drugs," said Dr. Loring. Her team has already proven the treatment works in animals. Now they're waiting on FDA approval for a clinical trial of 10 patients, Raub will be one of them. Raub is also a patient advocate and works tirelessly to fundraise for Summit for Stem Cell Foundation. "The disease is a progressive disease and their [patient's] time is of the essence, it's critical to people with Parkinson’s. The disease does not wait for an answer, it just keeps going," said Raub. Raub says she won't stop either, on behalf of all the patient's up against time.